If you’ve ever heard a parent say to a child who isn’t behaving “One…two…,” then you're probably hearing someone use some of the strategies described in 1-2-3 Magic. 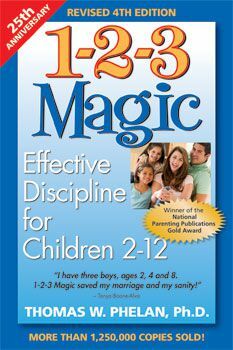 1-2-3 Magic, by Thomas Phelan, Ph.D., offers discipline strategies that can address a wide variety of child behavior problems. The premise of 1-2-3 Magic is based on fairly simple concepts—give directions effectively and stop arguing, nagging and pleading to gain compliance. When kids don't comply, parents are encouraged to start counting. If the child doesn't follow instructions by the time a parent reaches the number three, the child is given a negative consequence, such as time-out. Of course, there are times when parents are encouraged to give an immediate consequence, rather than offer three chances. If a child exhibits aggressive behavior, for example, the author recommends giving an immediate consequence. The program helps parents make consequences more effective while reducing manipulative behavior, such as whining and begging. While many programs lose effectiveness, 1-2-3 Magic can grow along with your child and be used for many years.The book covers how to use the program throughout a child’s development. Discipline strategies are appropriate for toddlers through tweens. Chapter 21: When Can You Talk? Overall, 1-2-3 Magic is likely to save parents a lot of time and energy that could be wasted on arguments. Kids are likely to learn pretty quickly that when Mom or Dad starts counting, they mean business. It’s also likely to help kids learn new skills and prevent many behavior problems before they start. It’s likely to be effective with many children with special needs, including kids with ADHD. One of the potential drawbacks of 1-2-3 Magic is that it gives kids three chances to comply. In the real world, your boss is likely to expect compliance the first time you're asked. You likely won't be given repeated warnings or reminders to follow through. Your child will figure out that he doesn't need to listen the first time you speak. Instead, he can keep playing or procrastinating right up until you're about to say, "three." Eventually, you might feel as though you're training your child to tune you out longer than you'd like. An alternative to counting to three is to offer an if...then warning where you follow through with a consequence after a single warning that makes the consequence of non-compliance clear. All in all, however, most parents are likely to find the program to be very effective. But, like any new parenting program, it only works if parents are consistent. Giving in, not giving a consequence, or backing down will show your child that he doesn't have to listen. So it's important to follow the program every day if you want to change your child's behavior. The 1-2-3 Magic approach to discipline can be effective for other caregivers too. Day care providers and teachers may benefit from the book. It's likely to be most effective when all of a child's caregivers follow the program. The 1-2-3 Magic website offers other resources in addition to the books. There are DVDs, workbooks and programs for both parents and teachers.